I don’t know about you, but I’ve been experiencing some déjà vu lately. A potential government shut down, inability to compromise on Continuing Resolutions, poorly-timed congressional recesses-- I get this weird feeling, almost as if this has all happened before.. But seriously, Congress is at it again. Fiscal Year 2012 begins on October 1st (just three whole days from now), and after weeks of negotiations, rejections, and lots of bickering over disaster aid funding, Congress is finally coming close to a solution: a Continuing Resolution to fund the government through October 4th (just six whole days from now). Now they’ll be able to squeeze in a few more days of that good ol’ bipartisan rancor! These back and forth, down-to-the-last-minute shenanigans (yes, I just said shenanigans) have become the catalyst for a national conversation about how reliable government actually is (not that people weren’t wondering that already). However, while there are understandably a ton of frustrated citizens out there, we can’t ignore the fact that on occasion Congress does pull through and get things done. How do legislators pull this off with so much on their plate? It all comes back to that same idea of reliability. Lawmakers rely heavily on their staff and colleagues for information and guidance on every single issue, and without this support it would be almost impossible for them to make educated decisions (go ahead and insert your own joke here, I know you want to). Everyone needs a little help when it comes to getting things done, so if legislators are relying on their staff, who is the staff relying on? That would be you, advocates. Each staffer may have less issue areas they need to be knowledgeable about compared to the Member, but they are also expected to be complete and total experts. That means knowing all sides of the issue, having the most up-to-date facts, and most importantly, understanding how their issue areas affect the district they work for. This is where you become an invaluable source of information for them, because you can offer them two things they couldn’t get otherwise: your specific expertise and your local story. Staffers truly want to know all sides of their issue, and that includes your side, the side they might not have seen in their day-to-day research. Combine that with your first-hand experience of how that issue affects your district, and suddenly you have become a resource that staffer can rely on. Once you have built this trust, you can bet that when your Member requires information about that issue for some upcoming piece of legislation, that designated staffer is going to utilize anything relevant you provided them with. 1) Identify your target. Whether you’re sending a letter, requesting a teleconference or setting up an in-person meeting, it’s important to make sure you are meeting with the right staffer. It is almost pointless to meet with a staff member that does not handle your specific issue. If I handle transportation and you’re coming in to talk about health care, everything you say to me is most likely going in one ear and out the other. I have enough to worry about. And those materials you left for me? Probably going in the trash. 2) Provide quality information. Think about strategy when deciding what information you should and shouldn’t provide to a staffer. You don’t want to just give them general facts they already know, but you also don’t want to provide them with a novel including every last little detail you have at your disposal. Decide what is most germane to what you would like accomplished legislatively, and then draw from the facts and experience that is directly relevant to that. 3) Keep the lines of communication open. If you want to build a relationship of trust and reliability with a staffer, don’t just speak with them once and consider your job done. Following up with new information shows them that you are always there as a resource. You shouldn’t constantly bombard them, just use your best judgment and reach out when necessary. I love ethics. Ethics are good. We should all have them, especially in Washington, D.C. The Toothpick Rule: No member of Congress or staff person may accept a "meal" from a lobbyist. The intent was to stop all those three-martini lunches we hear so much about (BTW, I've been in DC for 24 years and no one has taken me to a three-martini lunch. What am I doing wrong?). However, have you tried to define a "meal?" Turns out it's not as easy as you think. Is it sitting down? Is it a reception? Does it have to include alcohol? Does breakfast count (first meal of the day?). The result of seeking to clarify this is that members of Congress and their staff can attend an event where there might be food and lobbyists ONLY if there are no chairs in the room (so they can't sit down) and ONLY if the food itself can fit on a toothpick. Sure, you can eat as many toothpicked items as you want -- just don't sit. The "No Awards in the Wrong Room" Rule: One of my colleagues just told me about this one. We all know that organizations like to recognize members of Congress who have been particularly helpful on an issue. For example, both the American Library Association and the Humane Society of the United States -- not exactly the most "well-heeled" special interests -- give "legislator of the year" awards. However, under this rule they cannot give the legislator a physical token of the award (plaque, etc.) if that member of Congress is the one who requested the room that the award event will be held in. Bear in mind that the only way to get rooms on the hill is through a Congressional office. Now, you can hand the legislator the award in another room. Or in the hallway. Or in the bathroom. Just not in THAT particular room. Huh? Is there a concern that we're trading room space for recognition? Seems odd. I'm not suggesting that ethics are not sorely needed in Washington, D.C. I'm even a fan of Congressional codes of conduct (see the example for the House at: http://oce.house.gov/code-of-official-conduct.html -- in fact, I'll bet many Americans don't even know it exists!) I certainly can't be an apologist for the many crazy things that happen in D.C. But is this REALLY what we want legislators to be spending time on? Whether a certain food will fit on a toothpick? Or which room they accept a plaque in? For me the answer is no. What do you think? As I'm sure everyone knows, Saturday,September 17th is Constitution Day, although this year it's being observed on Friday September 16th, so go ahead and leave the office early in celebration! Personally, I'm all for making it a federal holiday, but I'm not getting a great deal of traction for this idea. Maybe that's because some of the provisions of the Constitution seem a little, ummm, questionable. Seriously, what on earth were the founding fathers thinking when they said things like "the Congress shall have the power to borrow money on the credit of the United States?" Seems like perhaps we got a little carried away on that one. That said, we certainly can't agree on whether changing the Constitution, for example with a balanced budget amendment, is a good or bad idea.We all have our own opinions. But in a way that's the whole point, right? We can argue publicly about what the Constitution means and what the founding fathers thought and what we -- as in "we the people" -- should do in terms of changing it. That's a LOT to celebrate. The pirate speaks,"We t' People o' t' United States, in Order t' form a more perfect Union, establish Justice, inaye domestic Tranquility,provide for t' common defence, promote t' general Welfare, and secure t' Blessin's o' Liberty t' ourselves and our Posterity, do ordain and establish this Constitution for t' United States o' America." Do Social Media Campaigns Really Work? We Think So (and we know best)! There was an interesting article in the Washington Post Style section this past weekend about a woman who started an online petition for JC Penney to retract a T-Shirt from its stores which read: “I’m too pretty to do my homework, so my brother has to do it for me.” Between the 1,600 signatures she collected by putting her campaign on Change.org and the negative comments JC Penney was receiving on Facebook and product reviews, the T-Shirt was pulled from their stores within 13 hours of the petition’s birth. This article is amusing, yes, but it is also very telling about the profound effect a social media campaign can have on a grassroots advocacy effort. It’s easy to get discouraged and think that the time and energy you put into your social media effort just ends up as white noise somewhere in the vast expanses of cyber space. Also, I would be lying if I claimed that every grassroots advocacy issue with a social media presence is successful within 13 hours (or at all for that matter). That said, what this article shows us is that a well-organized, well thought out campaign with a strong message can be extremely effective not only for building a foundation of supporters but for getting your message heard by the people you want to hear it. Your cause may not have an attention-grabbing, insulting T-Shirt to get people fired up, but if you can find a creative way to appeal to your audience, your advocacy base will only grow. Better yet, there is a serious possibility that you will accomplish something. Lately, I have heard a lot of chatter about the impact our two party system has on governance. The common accusation is that the political parties’ maneuvers and rhetoric has left the government incapacitated. In response, the majority of the American public has begun to identify themselves as independents. The words liberal and conservative, Republican and Democrat have become dirty to the rest of the country. The Republican presidential debate and President Obama's speech last week are only further fueling the public's frustration. There is an emergence of centrist groups, No Labels and Americans Elect, seeking to challenge partisanship and our two party system. Interestingly, this is not a new issue. When President George Washington retired from the presidency in 1796, His farewell address insightfully discusses the issues from political parties that are still applicable today. I can write a book about the pros and cons of the two party system and partisanship, if really interested read this article about possible reformers to help the system, but let’s discuss how you can overcome the challenges posed in our system and effectively advocate for your issue. 1. DO NOT BE DISCOURAGED. The system is not perfect, but many nonpartisan citizens have successfully advocated for their issue. 2. Use the power of Constituency. Members have gone against party marching orders in the past. Most of the time it is because the majority of the people living in their district were in favor of the option that was against the greater party’s interests. 3. Persistence is key. During my time on the Hill and on the campaign trail, persistence was always the name of the game. The people who successfully got representatives to change their position were the most persistent in their emails, letters, and meetings. 5. Lastly, gain support from larger groups to endorse your issue. These groups include trade associations, nonprofits, and local community organizations. You should target groups without official party affiliation and/or have groups from both sides of the aisle. 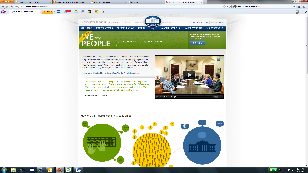 The White House Petition Site -- Useful? Or Useless? Many of you have probably heard that the Obama Administration is launching what's being called a "petition site." The idea is to have a place where people can directly petition the federal government -- you know, like it says in the First Amendment. If you can gather enough support, the White House will review your petition and send you an official response. I'm all for advocating in any way, shape or form and, hey, if you have a big enough cause I say go for it. Such a site may help raise the profile of your issue in a new way. First of all, in many cases a federal agency can't solve your problem. Unless you're talking about a regulation (i.e., the implementation of a law passed by Congress), one likely response you'll get from the White House is "hey, interesting idea, but we can't do anything about it. Congress needs to pass a law to allow that to happen." In some cases an agency may have some leeway, but for the most part the authority of the executive branch rests in its implementation powers, not in changing policy. But second, and more important, effective advocacy is all about telling a personal story that relates back to a policy issue. To be a truly engaged citizen -- a true participant in the "we the people" philosophy -- you'll need to think carefully and wholeheartedly about how what government does impacts you directly. Once you're able to connect that personal story back to government action you'll be far more likely to gain the attention of policy makers of all types and from all sides of the aisle. A "yeah, me too" kind of signature on a petition just won't get you there. So kudos to the Obama Administration for taking some steps to better listen to citizens. However, if you're a citizen who wants to move beyond being heard to to eventually be agreed with (our overall goal, right? ), you'll need to likewise move beyond petitions and toward active, effective engagement. Although I am known by the somewhat spiritual title of "Advocacy Guru," I must admit that I'm not really of any particular religious ilk (although many of my closest friends belong to some of the world's finest religions). Normally I wouldn't really notice the start of the Lenten season, but in February, my colleagues and I happened to be having a, umm, "staff meeting" at a local watering hole. There we saw a number of people with the mark of the cross on their foreheads in honor of Ash Wednesday. Sin #1 -- Non-Constituency: When requesting a meeting, whether with the member or a staff person, the first question you will be asked is "are you from the district or state?" Elected officials and their staff are there to represent a discreet group of people. You absolutely MUST demonstrate your relevance to that discreet group of people or they won't meet with you. Our meeting request letters always include the city of constituent asking for the meeting - and some offices will ask for a full street address just to be sure! Sin #3 - Assumption: As Robert Siegel once asked me when I worked at NPR "do you know the etymology of the word "assume?" My response was "who uses a word like 'etymology'?" Anyway, if you don't want to make a donkey's behind of yourself, never assume that your faxed or e-mailed request actually got to the office or that the scheduler will just magically get back to you. With hundreds of requests to go through a day, things get lost. Often. Be sure to follow-up (and be very polite - they don't lose things on purpose, they're just overwhelmed). Sin #4 - Member-itis: Never, ever insist that you will meet only with the member instead of a staff person. First of all, nine times out of ten you won't get a meeting. Members of Congress have unimaginable demands on their time and, believe it or not, you are not the only constituent in town at a given time. If you are offered a meeting with a staff person, that's a good thing! They often have more time to get to know you and your issues. All you'll probably get with the member is a "grip and grin," and the vague feeling that your issues weren't really covered. Sin #5 - Inflexibility: This is particularly a problem when it's combined with high expectations. Too many groups offer a very small meeting window and then are irritated when staff or members are not available in the 12:00pm to 2:00pm time slot they've designated for meetings. Try to have an entire day available - and ask participants in your lobby day to bring a good book. Sin #6 - Overzealousness: If you have multiple people coming from one district or state, do everything you can to coordinate before requesting meetings. In too many cases, each individual will request their own meeting. By the fifth meeting on the same topic, the staff are generally pretty cranky. They will thank you for your consideration of their time if you coordinate well. Sin #7 - Abandonment: Once you've had a meeting in Washington, DC or your state capitol, your advocacy for the year isn't finished. In fact, it's just started. In most cases you will need to work with the office on an ongoing basis to help them truly understand your issues and the impact of certain policy actions on their constituents. After your meeting, don't abandon your elected officials and their staff - embrace them (although not literally. Some of them aren't huggers). In eschewing these sins you will leave a better, fuller, happier advocacy-related life. Believe me, as the founder of the cult of effective advocacy I've had plenty of experience in this area. Please feel free to send your worldly possessions my way.